Sigh, I feel awful for leaving The Culture Bite for 2 months. I caught a case of the lazies and I couldn’t get myself motivated to write anymore reviews… until yesterday. It’s not surprising that pizza is what drew me back! A coworker, and fellow food lover, suggested we take a trip out to the Mint Plaza to try this brand new Napoletana-style pizza truck by a former Flour + Water chef, Jon Darsky. Holy smokes, this truck is impressive. Darsky shelled out $180 THOUSAND to build his new restaurant-on-wheels in a shipping container complete with a wood-burning oven that can reach up to 800-degrees and pop out 72 pies per hour. 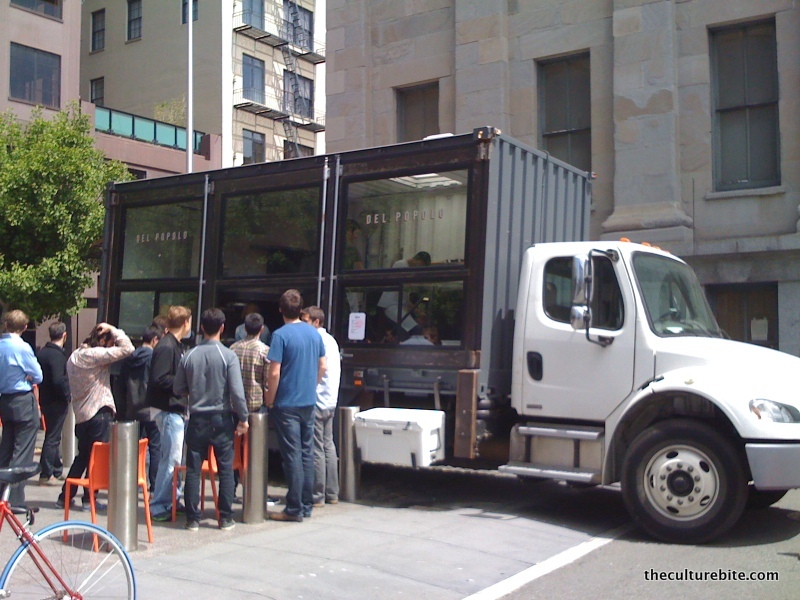 Do you see how insanely large this truck is compared to its patrons? 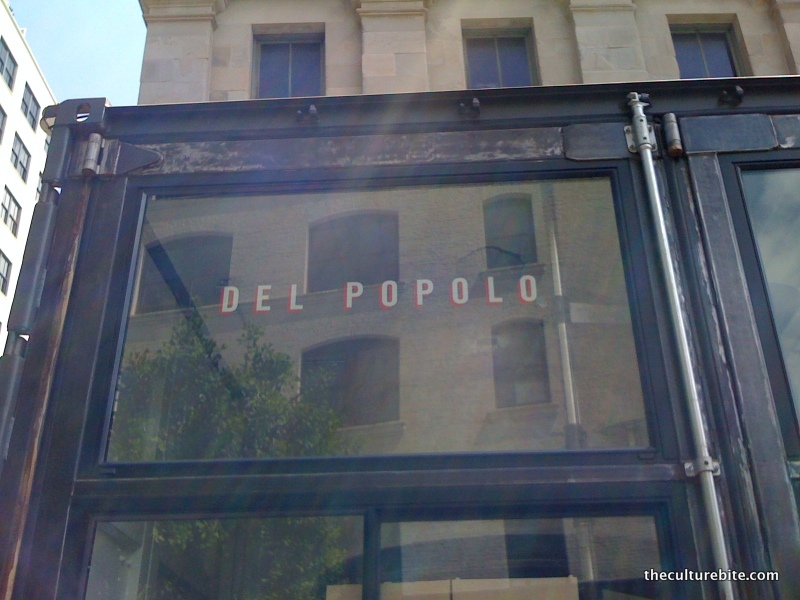 For $10 each, Del Popolo offers 2 different kinds of pizzas – a classic margherita and a white pizza. I opted for the margherita since it’s usually my benchmark for comparing authentic Napoletana-style pizzas. In less than 5 minutes, I had a piping hot, freshly baked pizza in my hands. We ate in the plaza because I couldn’t bear to trek 15 minutes back to work without a taste of this cheesy-tomato pie. As I pulled apart my first slice, I immediately felt the soft pillowy crust between my fingers. I thought that since the pizza was scorched in a 800-degree oven, the pizza would be crusty. Fooled I was! I took my first bite and immediately went into pizza heaven. The crust was soft, chewy and salty. The mozzarella was perfectly gooey and the sauce had the right amount of tanginess. 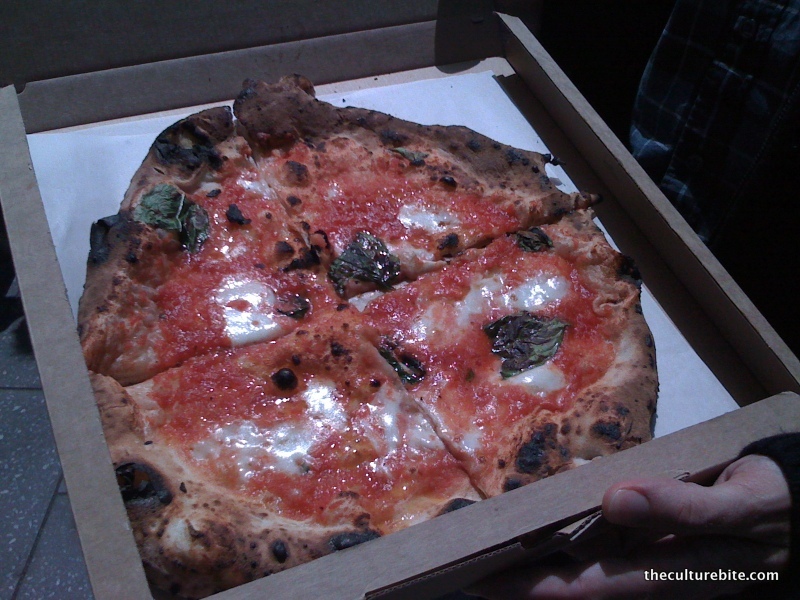 I would say their margherita pizza is on par with my favorite Tony’s Pizza Napoletana in North Beach. 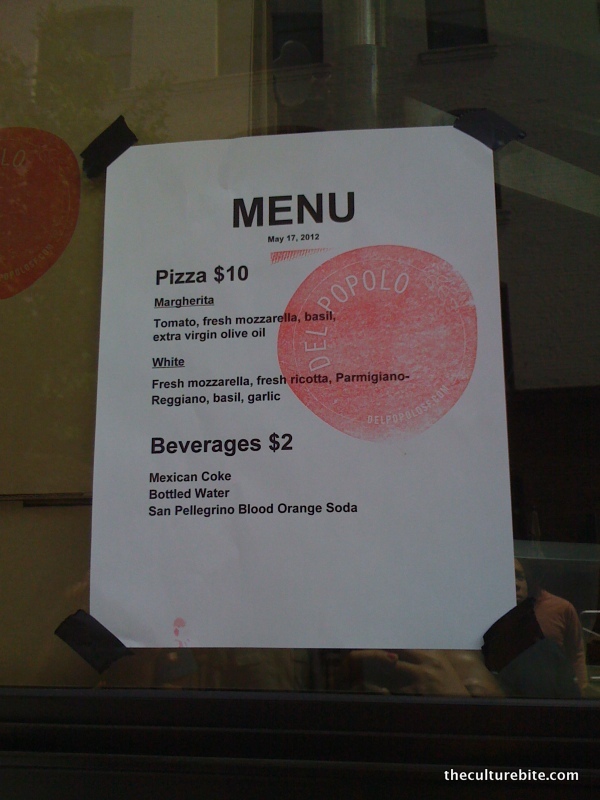 But instead of waiting 2 hours for a table at Tony’s, I could come early to Del Popolo, the pizza big-rig, and get a pizza in less than 5 min!